I Said I Wanted a LINE Cut! Note: This was not done intentionally (by the pet owner), and the cat is back to normal. Let us take you, now, through a true story submitted to Aha! 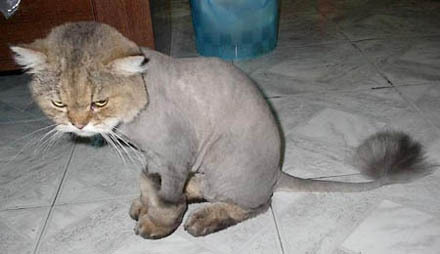 Jokes about a haircut, a groomer, a Southern accent, and one very angry cat! My sister-in-law is from Oklahoma and has a slight Southern accent. She has cats, and when she lived in the south, she would take them to the groomer's and have what is called a Line Cut. To her, a line cut is when all of the fur hanging down below the cat's tummy is taken off (because it gets matted or snarled). When she moved to Chicago with my brother, one of the cats fur got all tangled up during the move, so she took it in for a line cut. She was quite surprised when she heard the price, as it was twice as much as it was down south. 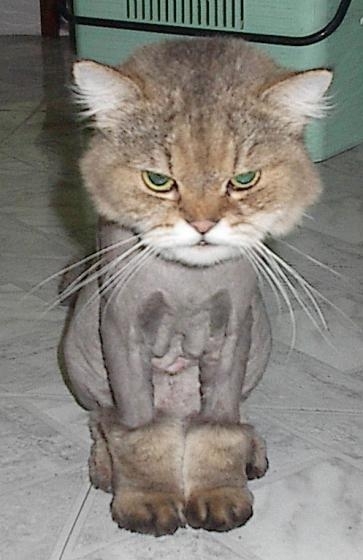 She confirmed with the groomer that he understood what a line cut was and he said "yes, I know what a LION cut is." It seems her accent came out sounding like LION not LINE and this is how her cat was returned to her! She cried for a week -- but not as much as the cat. It was November in Chicago, and the cat needed all the fur it had. Getting angry looks from one seriously upset cat -- priceless!